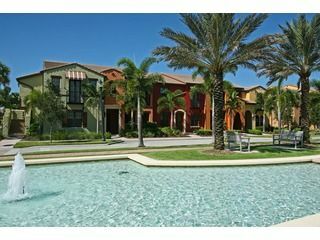 This rarely available 3 bedroom, 2.5 bathroom with attached 2 car garage corner unit town town home faces the water park in Ole at Lely Resort. The lower level features a built-in granite desk for use as a home office complete with wireless Internet access, ample storage space, and two bedrooms. As you take a short walk up the stairs, you are greeted by the nicely appointed living room, featuring a large flat screen television. Also on the main living floor, the kitchen has light wood cabinetry, granite, stainless steel appliances and a dining area with table. The master bedroom features a "Select-Comfort" mattress for a perfect nights sleep and a huge walk in closet. The master bathroom is finished in granite with his/her sinks, a Roman tub, and separate shower. The Village Center is just a short walk away and comes complete with movie theater, bistro, library, resort-style pool, state-of-the-art fitness center, corner pub, tennis courts, racquetball courts, and sand volleyball courts.